Was Demos numbered among as a new athlete. The blessed New Martyr of Christ Demos was from a suburb called Uzunköprü in Turkish, of the renowned city of Adrianople. Since he was a fisherman by trade, he spent much of his time in the fisheries. It chanced that Demos worked for an entire year at one of the breeding pools situated near Smyrna called Tsakal Bournou. Now this work was not only unprofitable, but also was the reason he remained in debt to his Ottoman employer. The following year another Turk bought the establishment. The former proprietor wished Demos to remit the loan and to have him continue working at the fish pond. Our Saint, however, realized that this job was not to his advantage. He, therefore, would not consent to keep his situation there, in spit of the fact that his co-workers (including Christians) encouraged him in this direction. His previous employer, after he flew into a rage, thinking he had no other recourse, maliciously slandered Demos. He claimed that Demos had taken an oath and sworn that he would become a Muslim if he no longer had to work in the fishery. The Muslim immediately found other false witnesses, and together they abducted the Saint and brought him to the judge. The Turkish judge chose to believe the Turkish plaintiffs. He directed Demos in the following manner, saying, "Deny Christ, just as you have vowed before these witnesses." The martyr protested that they were lying, that he never took such an oath, and that he never promised to become a Turk. He, rather, contended, that he was a Christian and believed in Christ. He confessed Jesus as true God; and, for the love of the Lord, he was ready to shed his blood. Demos, thereupon, was taken to the executioners from whom, among other severe tortures and punishments, he receive a savage repeating of blows with a stick to the soles of his feet. The Muslim torturers, afterward, cast the youth into prison and placed his bludgeoned feet into wooden stocks. In order to augment his sufferings, they embedded pieces of brick and other abrasive objects in the wood. Nevertheless the courageous soldier of Christ endured all these things as if they were happening to someone else. 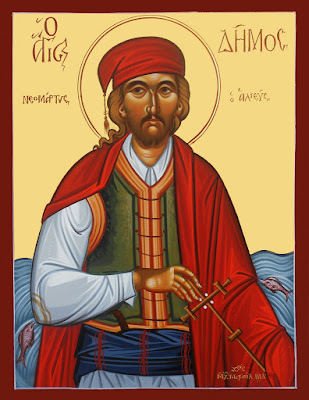 Nicholas, a certain visitor from the island of Leros, was passing through Smyrna and proceeded to the prison out of love for the martyr. He ate, drank and spoke with Demos, and, as a true friend to those who witness for Christ, he encouraged him to pursue the course of martyrdom. Subsequent to this, the judge brought the Saint out of prison on three occasions for interrogation. However, neither by flatteries, promises or gifts, nor by abundant threats, punishments or tortures was it possible to dislodge Demos from his faith in Christ. The judge, consequently, handed down to him the final sentence of death. Hence, the righteous Demos was beheaded and numbered with the choirs of holy martyrs in the year 1763. His honorable relics were purchased by the Christians who publicly buried them with honor at the Church of the Holy Great Martyr George. 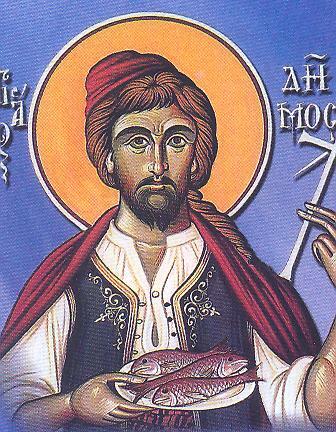 One day, after the burial, which was the Sunday of the Paralytic during the Pentecostarion period, the teacher Hierotheos, who was present, honored the martyr with encomiums. Indeed, God is wondrous in His saints, Who through this martyr worked many miracles to glorify those who glorify the Lord, as the following will reveal. There was a certain tailor who had no other means of livelihood other than his handiwork. The unfortunate man seriously injured the thumb of his right hand, so much so that, for fifteen days, he was incapable of even holding a pin. Therefore, extremely distraught from the pain of his hand and from the need which poverty had imposed on him, he remembered the young martyr of Christ, Demos, and hastened to his grave. The tailor called upon Saint Demos with both faith and piety, putting the wounded thumb upon the blessed one's tomb. Tears filled the petitioner's eyes as he entreated the martyr for a cure. Lo, the miracle! Immediately, the next morning, the tailor found himself cured and sound, so that he was able to return to the labors of his trade unimpeded. In addition, the wife of this same tailor suffered blindness in both eyes for three years. So damaged was her eyesight that she had to be led to church by the hand. Upon learning of her husband's cure by the Saint, she was directed by her guide to the martyr's tomb, accompanied by other women. She reverently venerated the holy Demos' relics, asking with faith for his help to restore her vision. She then returned to her house, being assisted by these women. John Aslanoglu suffered from intense headaches and other acute pains. The moment he called upon the name of the Saint, he instantly was delivered from his infirmities and was never troubled again by such complaints for the rest of his life, notwithstanding that he lived for another thirty-five years. Additionally, many others were healed from fevers and similar illnesses; for when they resorted to the martyr's tomb and prayed with faith, they received their much-desired health. One Saturday, after the passage of some time, the Orthodox took out the holy relics of the venerable martyr from his tomb. Such a sweet and ineffable fragrance was emitted that the following noteworthy miracle occurred. Hieromonk Matthew from Chios, who assisted in the translation of the relics, went to a neighborhood in Smyrna where many Chiotes had settled. His fellow countrymen sensed the sublime fragrance issuing from the priest's hands and garments. Astonished, they questioned him as to the source of the splendid scent. The priest explained in this way: "Today, we transferred the sacred relics of the sacred Martyr Demos and placed them inside the holy bema of the Church of Saint George. As a result, a little of the overwhelming fragrance has remained on me." Therefore, O Christian, in such a way does the beneficent God glorify those who glorify Him. May we, too, be granted divine mercy and those eternal good things of His heavenly kingdom, through the intercession of His holy martyr Demos! Amen.